When German Jalopnik reader Andreas (TheSafetyEngineer) told me he knew a guy near Nuernberg who hoarded Mitsubishis, I figured he was talking about someone who was in over his head with maybe five or six Lancers pouring out of his driveway. Boy, was I wrong. It turns out the ultimate Mitsubishi stash isn’t in Japan, but Germany. Tilo Macht and his wife Anja, owners of Autohaus Macht—a small shop in Eckental, Bavaria that specializes in fixing Subarus, Mitsubishis, Suzukis and Saabs—are legitimately obsessed with old Mitsubishis. Like, Someone Should Have Staged An Intervention Decades Ago-obsessed. But it’s too late. After growing up in a household that sold Mitsubishi, Tilo now owns well over 100 of the cars, ranging from standard little Colts to extremely rare FTOs. The duo get their cars from everywhere, including German car buying websites, car museums (one actually came from the Mitsubishi Museum in Japan), and U.S. army bases. Others are either driven or shipped from Japan, England, Australia, the Netherlands—all over the place. 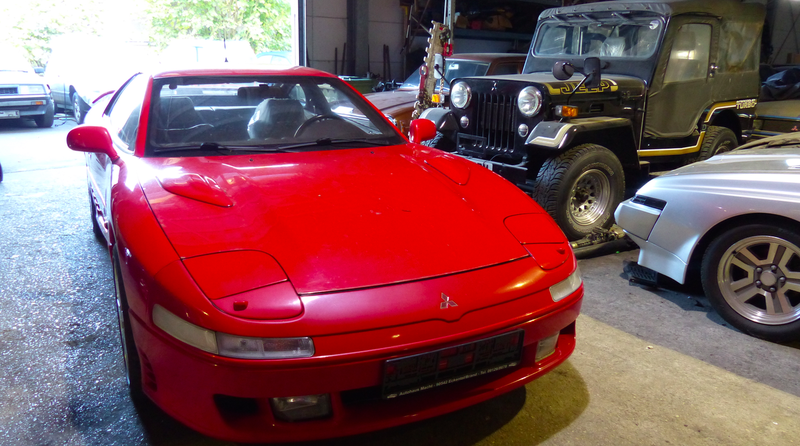 The Machts’ need to satiate their Mitsubishi love knows no geographical bounds. Why so many Mitsubishis, and why that brand? Tilo told me he’s the son of a Mitsubishi dealer and just loves the cars. Plus, he considers them as an advertising tool and a long-term investment. I don’t know about that last part, but you can’t doubt their enthusiasm. Tilo and Anja own 12 old Lancer Turbos—12 of the same car! And they have eight Sapporos! We get to benefit from their almost-clinical addition by feasting our eyes on droves of gorgeous Mitsubishis. As soon as I got to the workshop, I was greeted by a huge line of modified Mitsubishis and Subarus, many of which Tilo and his team modded themselves. Though they look neatly placed in front of the shop, they’re not garage queens: Tilo actually drives these things. He told me about a time he drove to a local rally in one of his own Rally-liveried cars shown below, and was actually waved in to the pits by the race staff! And even though he didn’t take them up on their offer, he does run these things in “Old School Rallies” just like god intended. One of the coolest cars out front was this old Lancer from Hungary, which has an EVO III engine and an R34 GT-R turbo and intake. And then around the side, I had even more to take in. Then there’s this ridiculously low-mileage, extremely rare Lancer 1800 Turbo imported from the Mitsubishi Museum in Japan. It’s in immaculate condition. Behind it is an Eclipse and a Mitsubishi Colt. But even if the Eclipse looks more badass than the little white hatchback, it’s the Colt that deserves your attention. That’s because it has been the recipient of an FTO engine swap, meaning it makes 200 horsepower from a 2.0-liter V6, and on top of all that, it’s got EVO III suspension and brake systems. There’s also another Colt in the garage that’s going to have a Galant’s 2.5-liter V6 shoved in its engine bay, and will also get a wide-body kit that’s been sitting in the back of the shop. Here’s the rest of the lineup on the right side of the building, starting with a convertible Mitsubishi Sapporo (one of only 300 in Europe, I’m told— Tilo has two in his collection), and a rare Lancer GTI. And a Carisma! It’s an ocean of classic Mitsubishis. And smack-dab in the front is a 1977 Lancer Kombi—one of apparently just two in all of Germany. And right next to it is a Mitsubishi Pajero, basically Mitsubishi’s version of the CJ-3B. Here’s a yellow Mitsubishi Celeste, which received a Pajero 2.3-liter diesel engine swap from the Netherlands (apparently only about 1,000 Celestes got such a treatment). But the star of the entire collection is this beautiful old Colt 1000, which Tilo and Anja got from Australia, and of which I’m told there are only 10 left in the whole world! And in front of it, there’s the first car in the collection, an old Galant. It was in this car that Tilo got into a really bad accident. One of his friends bet him he could never fix the car up, as the entire front and driver’s side had been torn open like a sardine can. But since Tilo isn’t one to turn down a bet, he spent a year working on the car almost every other day, and got it to the shape you see above. It’s a bit of an oddball car, now. The spoiler and exhaust come from a BMW, the wheels are from a VW Golf, and Tilo built his own adjustable coilover suspension system. But there’s more. Just outside of the garage sit a bunch of cars. I think it’s safe to say that Tilo and Anja, despite perhaps having an incurable Mitsubishi disease, are my heroes.